Enter the numerator and denominator for the first fraction in the equation. If you would like the fraction to be whole number, simply enter the desired whole number in the numerator field and enter a 1 in the denominator field (4/1 = 4). Enter the numerator and denominator for the second fraction in the equation. If you would like the fraction to be whole number, simply enter the desired whole number in the numerator field and enter a 1 in the denominator field (4/1 = 4). Enter the numerator and denominator for the third fraction in the equation. If you would like the fraction to be whole number, simply enter the desired whole number in the numerator field and enter a 1 in the denominator field (4/1 = 4). This is the result of performing the selected operations on the three fractions. After calculating the addition or subtraction, the calculator will show its work and give a detailed explanation of each step it took to arrive at this answer. 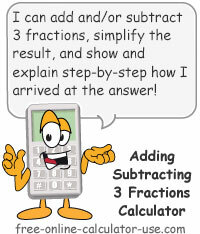 This calculator will perform any combination of addition and subtraction on three fractions -- regardless if the three fractions have the same or different denominators -- and give the result in simplest form. Plus, unlike other online fraction calculators, this calculator will show its work and give a detailed step-by-step explanation as to how it arrived at the answer. Enter the numerator (top) and the denominator (bottom) of the first fraction. Select + (plus) or - (minus) from the first add subtract fractions drop down menu. Select + (plus) or - (minus) from the second add subtract fractions drop down menu. Note that for Steps #1, #3, and #5 you can enter a whole number by entering the number in the numerator and entering a "1" in the denominator (4/1 = 4). Click the "Add/Subtract 3 Fractions" button. This will display the result of the additions and subtractions and generate a step-by-step explanation showing how the calculator arrived at the result. The first number in an addition equation. In the equation 4 + 2, 4 is the augend. The second number in an addition equation. In the equation 4 + 2, 2 is the addend. The first number in an subtraction equation. In the equation 4 - 2, 4 is the minuend. The second number in an subtraction equation. In the equation 4 - 2, 2 is the subtrahend. The top number in a fraction. The bottom number in a fraction. The process used by the Add/Subtract 3 Fractions Calculator to find the smallest number that the denominators of two or more fractions will all divide into evenly. This process is necessary for adding, subtracting, or comparing fractions with different denominators. How to add and subtract 3 fractions. How Do You Add 3 Fractions? The answer to that question depends on whether you are adding fractions with like denominators or adding fractions with unlike denominators. Adding 3 fractions with unlike denominators requires a little more work (unless you use the calculator on this page), because in order to add the 3 fractions you must first turn their unlike denominators into like denominators. You do that by finding the lowest common multiple (LCM) of the denominators. To illustrate how you use LCM to turn unlike denominators into like denominators, let's suppose you want to add the fractions 1/2, 2/3, and 3/4. The first step is to find the lowest number that 2, 3, and 4 will each divide into evenly (the LCM). According to my calculations, the LCM of the three denominators is 12. Once we have found the LCM for the three denominators, the next step is to multiply the top and bottom of each fraction by the number of times each fraction's denominator goes into the LCM (remember, as long as you multiply the top and bottom of a fraction by the same number, the fraction's decimal value does not change, as in 1/2 = 2/4 = 4/8 and so on -- because all of the latter divide out to .5). Since 2 goes into 12 a total of 6 times, you would multiply the top and bottom of 1/2 by 6, which results in 6/12. Next, since 3 goes into 12 a total of 4 times, you would multiply the top and bottom of 2/3 by 4, which results in 8/12. Then, since 4 goes into 12 a total of 3 times, you would multiply the top and bottom of 3/4 by 3, which results in 9/12. Finally, since all three denominators are now the same, you simply add the numerators (6 + 8 + 9) while keeping the denominator (12) the same -- giving you a result of 23/12. But since 23/12 is an improper fraction, you would convert it to the mixed number 1 and 11/12. The steps to subtract 3 fractions with like or different denominators are the same as the steps to add fractions, you just subtract the numerators while keeping the denominators the same.